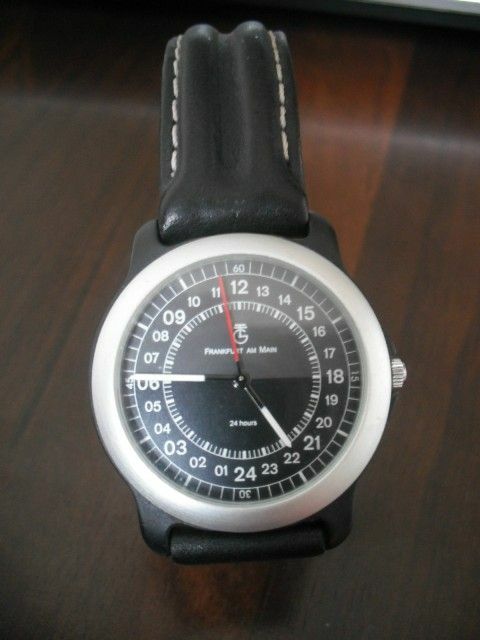 This is 10th Afka's weekly watch posting in 24h forum and it happens to be a cheap plastic promotional watch. 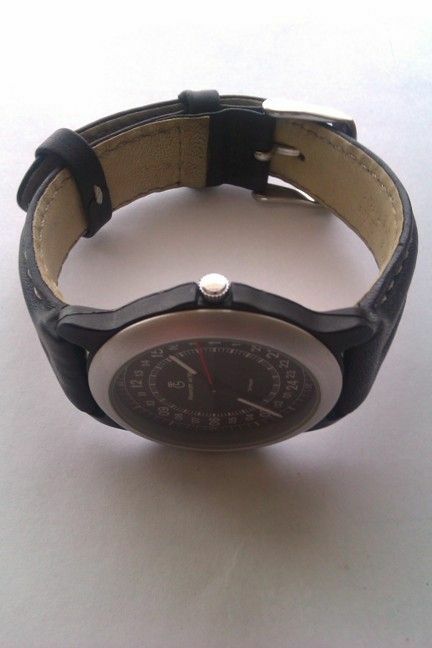 This watch was purchased in February 2013 for EUR 30 (incl. shipping from Germany). 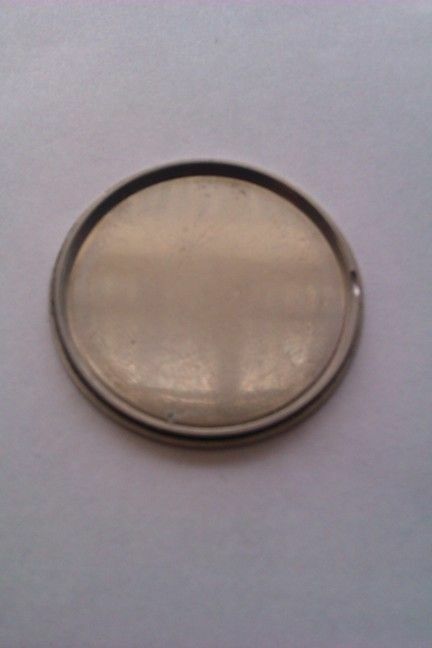 The seller had only one photo and in the description stands “the battery needs to be replaced; I can’t guarantee that it will work”. But watch’s face on the picture was really nice and even nine bidders participated in auction. This is cheap plastic watch. Should it deserve a review at all? I would say yes. With every watch I have I’m learning something new. And for a beginner like I am, here I had even two lessons – logo identification and crystal testing. I don’t know how to call this watch. As far as I know Bosch is not a watchmaker and if needed, they ordered promotional watches from other watchmakers like Citizen. 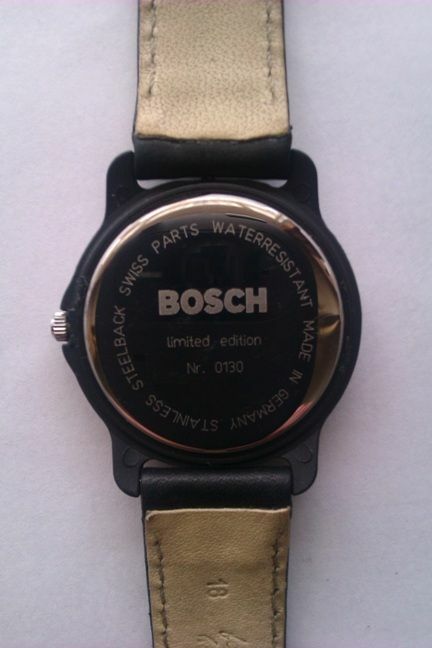 But the main text on caseback is Bosch and let it be Bosch. 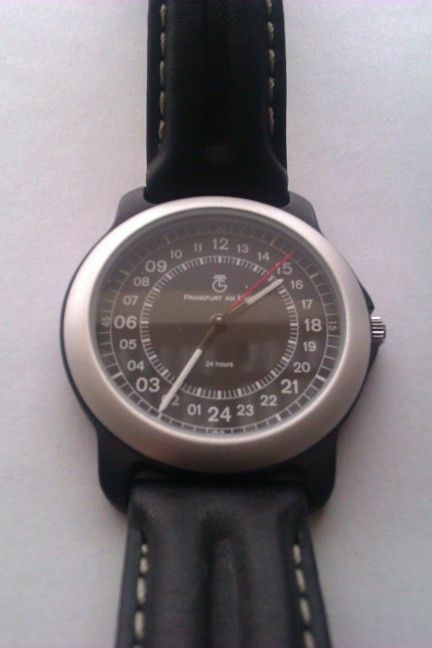 For which company this promotional watch was made, that is the question? On the dial you see a company logo. Main element is big “G” with something like antennas added. And below logo is text “Frankfurt am Main”. For me they obviously belong together. First I was looking for companies related to famous Frankfurt Airport. That sounds logical for a 24h watch. No chance. Of course I can’t find anything inside big Bosch consortium. As one of the last chances I checked out hundreds and hundreds of German company logos in Brands of the World database. Conducting a Trademark Search was interesting, but without any result. My first lesson was a failure. If you have an unknown logo then it is very hard to find out the owner. The only chance left is when some German member who knows this logo is reading this story and responds. This cheap watch has plastic case. I supposed that the crystal is also plastic. But the crystal was absolute flawless, without any scratches, and I asked myself me how to make sure, is it acrylic or mineral? There are several threads and other sources on testing crystal. In most cases the difficult task is to make difference between mineral and sapphire crystals. I would say that the best description of these tests I found in Watchlords (Sapphire crystal water test. Fool proof?). I like the simplest test – tapping crystals with fingernail and distinguish sounds like “tink” (acrylic) and “clunk” (minerale and sapphire). It is written there that you can even sense different sounds when tapping mineral and sapphire, “although this is an acquired skill”. Of course I opened all my drawers and started tapping my watches to acquire these skills. I’m not sure how good I am, but here with Bosch we have “flat tink”. 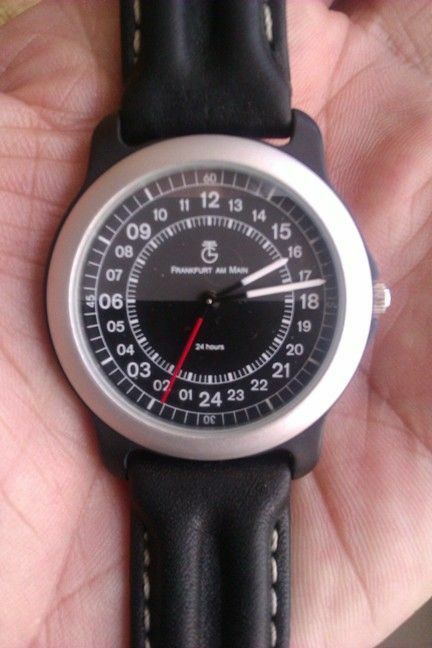 What fits not so good into image of cheap plastic promotional watch is the limited edition message on caseback. The movement is standard – Ronda 763.24H – but here is the original Swiss version inside. 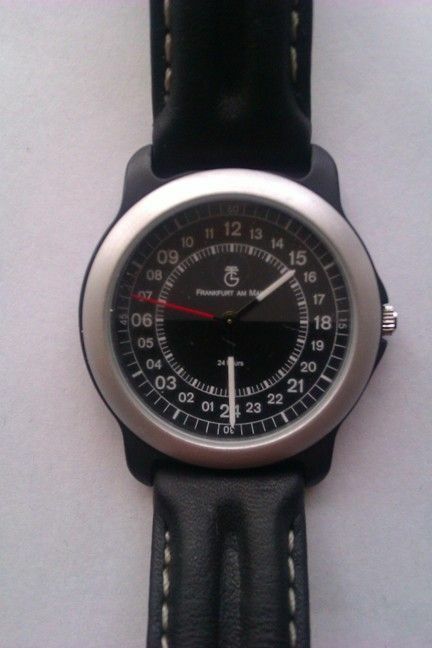 And I really believe that this watch is “made in Germany”. 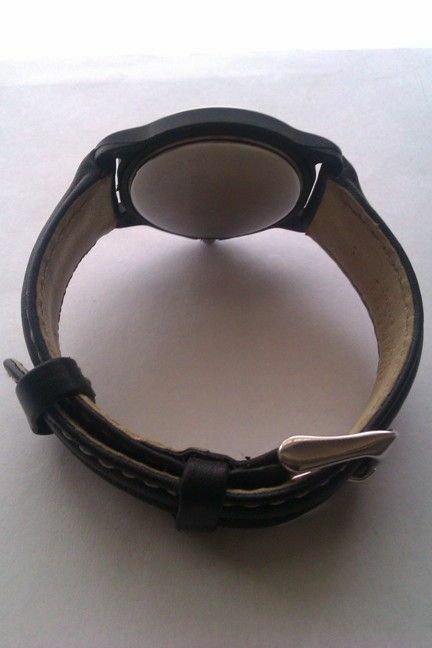 The “feinstes Leder handgearbeitet” leather strap is also nice. The best part of this watch is face. I like here everything – 12 on top, dark greyish upper and black lower halves, color and length of hands. Especially for promotional watches very often crazy or hilarious dials are used. Nobody ever wears them and they are just disposable. Here we have a fully functional 24h watch you can actually wear and use if you like. This watch can be for you too small or too cheap. But for me it is good. Last edited by Afka; April 12th, 2013 at 12:10.
peagreen, Dennis Smith and CCCP like this. Congratulations for acquiring what I consider THE perfect item for a collector ! Perfect condition and a rare piece. You wrote that "it could be too cheap" : you must be joking for sure. (It reminds me of an old tv ad in France which became a running joke : a rich man tells his son who bought a small sport car : nice, but not expensive enough, my son). Excellent review. I actually have this watch. I like it: 12 on top, different colour for day and night. Although I am from Germany I cannot help you with the logo. It is not the standard Bosch logo. 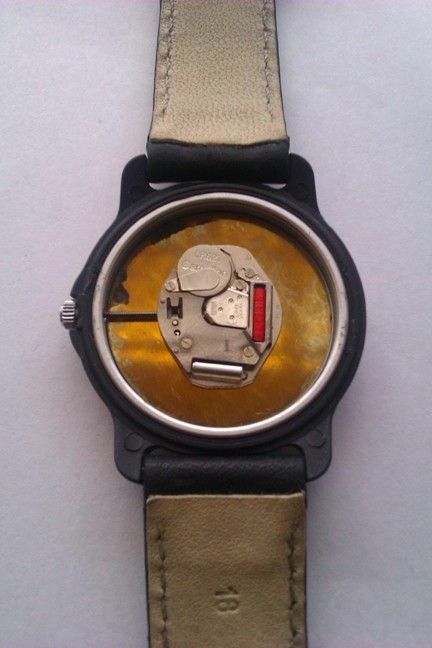 Do you have any idea of the date of production of this watch ? Can it still be found in Germany ? A nice watch and intriguing! google allows us to search for an image by uploading it and I tried that with the company logo you posted above. No matches but what google considers "similar images" is interesting in itself but nothing there that I consider comes even close. Please let us know if you ever do find out. I don't know, but maybe raschid can help us? Especially it will be interesting when and where he bought this watch. From what I've gathered, Frankfurt am Main is another name for the German stock exchange. This may have been a promotional watch given to traders on the floor of the stock exchange. This is just a wild guess though. Good luck and great find! Yes, that's right. This watch on the picture is Citizen. Made by Citizon for Bosch to celebrate Bosch 80th anniversary. 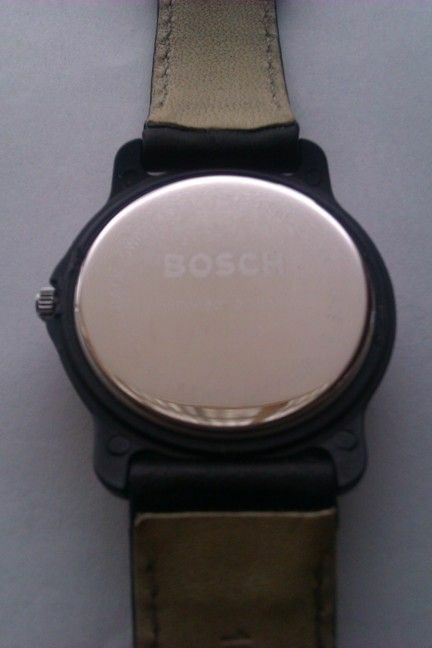 In review we have watch made by Bosch (according to caseback) for some unknown company's promotion. If you can provide me with a higher resolution of the 'G' logo I can do a little detective work.